Nachos were first created in 1943, when Chef Ignacio Anaya made a batch for some starved military wives in Mexico, right near Fort Duncan, Texas. The original process was dynamic yet simple. He fried up some tortilla chips, layered on some cheddar cheese, topped it off with a thin layer of jalapenos, and served it to the women as an appetizer. The name nacho came from Chef Anaya’s own first name, “nacho” being short for the full name “Ignacio”. 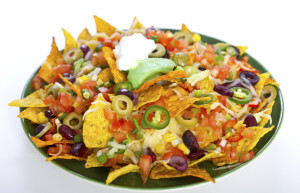 Soon after the nacho was changed from its traditional recipe and changed the American snacking industry. Although now synonymous with nachos, the orange melted nacho cheese is not part of the traditional nacho recipe, instead created by the American Frank Liberto. He took the idea of nachos and started selling them at Arlington Field, which used to be home of the Texas Rangers Baseball team at the time. He realized that the traditional cheddar cheese did not have a great shelf life, and he created the melted nacho cheese that we all have fallen in love with. This new kind of cheese this has become the staple to American nachos: from here on out nachos were never the same again. The snack food then expanded past sporting events to restaurants, movie theaters, and anywhere else hot snacks can be had. Today, nachos have expanded way past the basic cheddar cheese and jalapeno combo. Now you can get almost anything you want on them. Featuring meat and many more types of cheeses and toppings the creations are endless. Nachos have grown into not only an appetizer but also a dessert, featuring different kinds of cookies as the chips with multiple sweet toppings. Being such a versatile snack it provides joy to any kind of palate. From vegetarian to meat lovers, you can find a nacho that suits you. Nachos have had a long standing tradition for being one of the best snack foods. From the melty cheese to the crunchy chips nachos have something that everyone loves. If you are interested in trying some awesome authentic Mexican nachos or other traditional Mexican cuisine, check out the menus at Acapulcos and try out something that is sure to put a smile on your face.